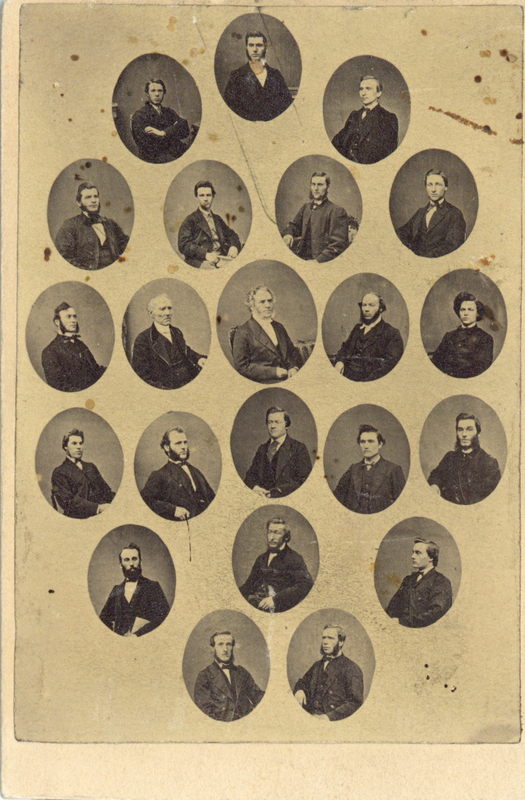 The letter located in MS-2-7, SF Box 13, Folder 4, Item 16 describes this photograph. The names of the photograph's subjects are listed in the letter: Nelson; Alex Rae Garvie (? ); Joseph Hogg; D. Miller; J. (?) Forrest; Oliphant; Christie; Glender; J. (?) D. Murray; Prof. Smith; King; McKnight; J. Bearst (? ); Mowatt; Stewart; 2 Sinclairs; McDougall; Howard; Archibald; Allan Simpson; and Ed Archibald. The letter also descibes a photograph of Thomas McCulloch but it is not clear if he is part of this composite photograph.